At Randolph Air Force Base in San Antonio, Texas, B&N transformed a 1930s barracks building into a high-tech, worldwide operational hub for the U.S. Air Force. 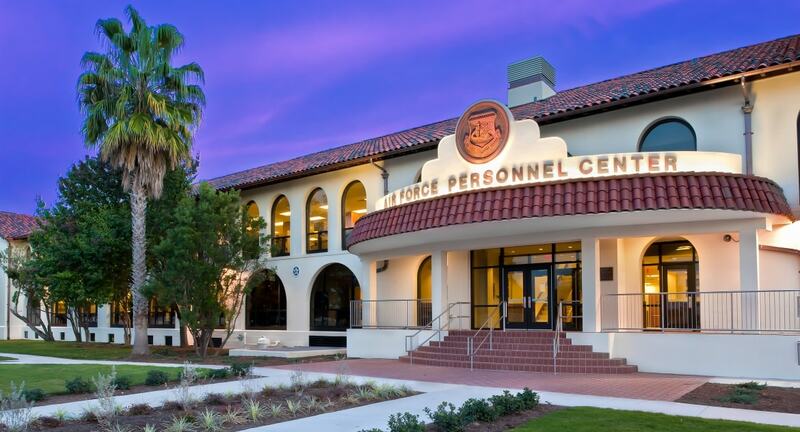 The five-wing, former barracks complex houses the Air Force Personnel Center (AFPC) Headquarters – a field operating agency responsible for managing the personnel programs and policies that impact all active-duty and civilian Air Force members. B&N was the Designer of Record for the $37 million, 188,747-squre-foot design-build renovation of Building 499 A and C Wings in the Air Force Personnel Center (AFPC). B&N led the multi-party design team for this mission critical command that frequently communicates with the Pentagon and active military theaters around the world. Services provided included building design, interior design, and structural and site civil engineering. Aesthetically, the design restores the building’s original architecture, including arched bays and windows that were filled in with concrete masonry in the 1960s. But beneath the façade is a technologically advanced facility that houses the AFPC’s administrative and network infrastructure. There were many facets to this complex project. The interior design had to meet the unique needs of 27 command groups while the exterior architecture had to maintain historic preservation guidelines. It included the procurement and implementation of a multi-million dollar Furniture, Fixtures and Equipment (FF&E) package for 1,300+ staff members. In addition, construction could not disrupt operation of the facility’s other three wings. Work was coordinated across two design-build teams. Development of the total design involved participation from five separate design firms, all under different design contracts. To bring the 80-year-old structure up to current anti-terrorism/force protection (AT/FP) standards, B&N retrofitted the building shell with blast resistant capabilities. A thin composite blast wall made of high strength fiber/mesh fabric and an array of four-inch structural tubes was installed on the interior face of the outer building shell. This gives the historic building a hidden armor without needing to construct a concrete block shell that would mask the original structure. The mission critical functions hosted in this facility require spaces with unique security and technical performance capabilities. This includes a board room where all Air Force promotion decisions are made, a 2,675-square-foot Sensitive Compartmented Information Facility (SCIF) used to process classified information and conference spaces with state-of-the-art audio visual and security features. The renovation of the AFPC was designed to meet LEED® Silver Major Renovation criteria.